Most tennis players choose a tennis racquet with great care, but many don't realize that their racquet's stringing may have a more profound effect on their game than their carefully chosen frame. At a minimum, every tennis player should understand the basic trade-offs among comfort, power, control, and spin in relation to string tension. Any decent tennis racquet will have a recommended range of string tensions, for example, 58 to 68 pounds. When we talk about low or high tension, it makes sense to confine ourselves within no more than 10% outside this range, because at extremely low tensions, some of the normal correlations break down. Within the recommended tension range for a given set of strings, lower tensions offer significantly less stress on the arm. Looser strings also produce slightly more power, but they hit farther primarily because the ball stays on the strings longer, which makes it leave the racquet on a higher trajectory, as on most swings the racquet tilts upward and rises as it moves forward. Higher tensions offer significantly more control at a given level of topspin. Topspin improves control by making the ball fall faster as it flies forward. For a swing at a given speed and upward angle, some strings produce more topspin at lower tensions, some at higher tensions, with differences on the order of 10% or less. When a player's swing brushes the strings up the back of the ball while also smacking it forward, as most advanced players' swings usually do, a faster swing increases both spin and power. The slightly reduced power, lower exit trajectory of the ball and increased control resulting from higher string tensions allow players to swing faster without hitting long, and when they swing faster at a given upward stroke angle, they produce greater topspin. The key to understanding why lower string tensions yield slightly more power is to compare the energy return offered by the strings to that offered by the ball. If you read the official rules of tennis, you'll find a section that specifies that the ball, when dropped on concrete from 100 inches, shall rebound to between 53 and 58 inches. In any collision, some energy is lost to vibration and friction, and in the case of a tennis ball, a huge amount is lost in deforming the ball's materials. As the ball hits the concrete, part of it compresses, and the rubber stores some of that energy, which is then released as the ball uncompresses. If all of that energy were stored with perfect efficiency, the ball would bounce right back to 100 inches (in a vacuum), but as a tennis ball is designed, it dissipates around 45% of that energy. A Superball is better at storing its compression energy, and it will bounce back much higher when dropped from the same height, but a ball that could bounce back to 100% of its original height is still a physical impossibility. If such a ball were possible, it would bounce forever. A tennis ball returns only 55% or so of its impact energy, but strings return more than 90%. When a ball collides with strings, both deform to some extent. The more the strings store the energy of the collision by deforming like a trampoline, the less the ball stores energy by flattening. To get the most energy return out of the collision, we want the strings to store as much of the total energy as possible because they will give back more than 90% of it, whereas almost half of any energy stored in the ball will be wasted. Looser strings deform more easily, thus storing more of the energy of the collision and minimizing the amount wasted by the ball. At this point, looser strings sound ideal. We should all know better than to waste energy, after all. So, why, at a given level of topspin, do looser strings cause a loss of control? As the looser string bed compresses more, the ball stays on the strings longer, during which time any tiny changes in your racquet position can change the path of the ball. The ball isn't on your strings long enough for you to consciously do anything to it. Your brain can't execute any actions in the few milliseconds available, but that few milliseconds is enough time for the unintended movement to occur, especially when an off-center hit exerts a turning force on the racquet head. The differences in power and trade-offs between comfort and control apply reliably within a given set of strings at a given level of topspin, but stiffer strings, like most polyesters and all Kevlars/Aramids, behave as if they were tighter, and some strings, such as many co-polyesters, produce significantly more spin than others. Among the strings with high spin potential, some produce greater spin at lower tensions, while others produce greater spin at higher tensions. As a result, the differences resulting from changes in tension can't be compared across different types of string; a stiffer string or one that produces better spin at lower tensions may allow for at least as much control at lower tension as another string does at higher tension. Stiffer strings are thus often strung looser, because they behave as if they were tighter, including in their effects on the arm. 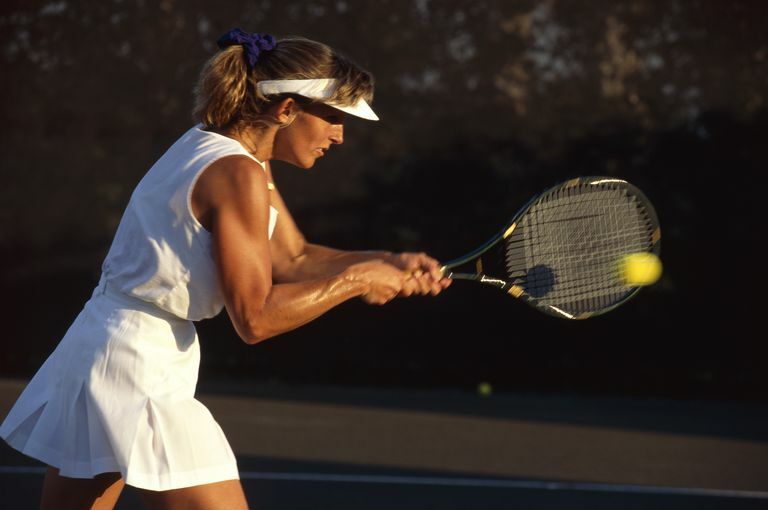 If you like to take a fast swing at the ball and use topspin, you'll get the best combination of spin and control by using strings with high spin potential that produce more spin at higher tensions and stringing them tight, but if your arm demands lower tensions for comfort, you should experiment with strings that produce greater spin as you decrease tension, and if none of them are soft enough, you may have to settle for less spin potential in order to keep your arm healthy. Data on the spin potential of strings is very limited; you may benefit yourself and many others by writing to the string manufacturers, asking them to test their strings and include that information on their labels.